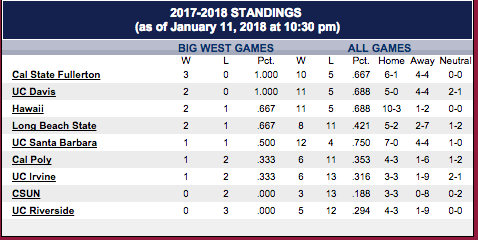 It’s still early in the Big West Conference regular season, but either Hawai’i or UC Santa Barbara could take a big step toward contention on Saturday night. The suddenly defensive Warriors will try to stop the upstart Gauchos in a crucial Big West game at the Stan Sheriff Center. 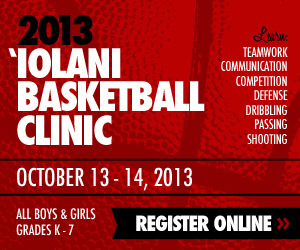 It is scheduled to start around 8 p.m. as part of a University of Hawai’i basketball doubleheader. The UH women’s team will host Long Beach State at 5:30 p.m. Fans with tickets to the men’s game are invited to arrive early and watch the women’s game. 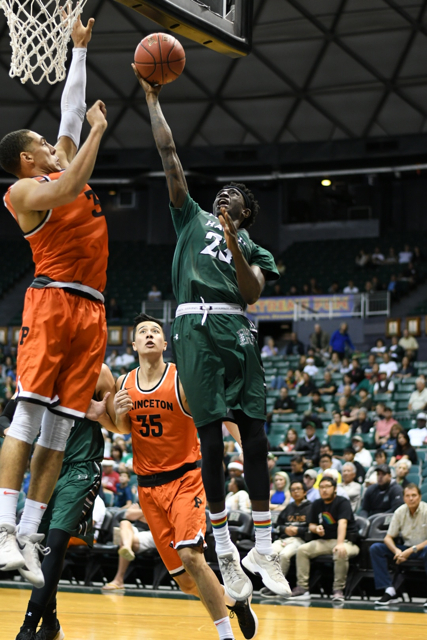 The Rainbow Warriors are 11-5 overall and 2-1 in the Big West. They are coming off two elite defensive performances, holding both CSUN and Cal Poly under 50 points. UCSB is 12-4 and 1-1, and have had a full week to prepare – and travel – for this game. The Gauchos are one of the top turnaround teams in the country, having finished 6-22 last season. The Gauchos will bring the top statistical offense in the Big West. They lead the conference in scoring (78.0), field goal percentage (.471), 3-point percentage (.388) and assists (15.6). UCSB has been consistent so far this season behind a consistent starting lineup – guards Marcus Jackson, Max Heidegger and Gabe Vincent, and forwards Leland King II and Jalen Canty. Hawai’i head coach Eran Ganot noted that all five UCSB starters are candidates for all-conference honors. Heidegger, a 6-foot-2 sophomore guard, leads the Big West in scoring at 21.6 points per game, and 3-pointers made with 50. Jackson, a 6-3 graduate transfer from Rice, is averaging 7.8 points and 4.9 assists per game. Vincent, a 6-3 senior, is contributing 10.4 points and 3.5 assists per game. King, a 6-7 graduate transfer from Nevada, is averaging 17.1 points per game and leads the Big West with 10.4 rebounds per game. Canty, a 6-8 senior, is averaging 11.6 points and 7.6 rebounds per game, and is shooting 59.8 percent from the field. The Warriors have been stingy on the defensive perimeter of late. 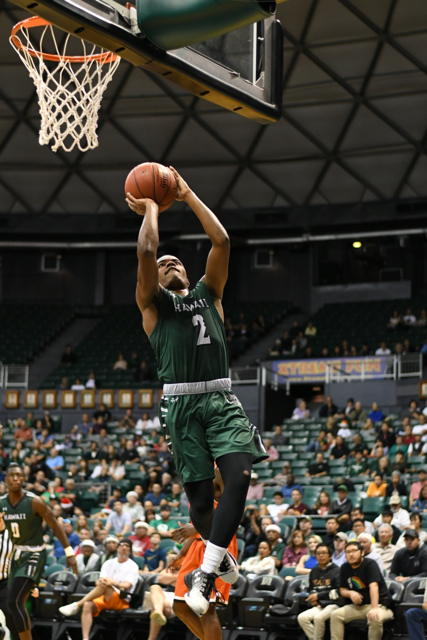 In its three Big West games so far this season, Hawai’i is allowing opponents to shoot just 15.9 percent (7 for 44) from 3-point range. Senior forward Mike Thomas has been a force for the Warriors. He leads the team in scoring (12.8), rebounding (6.4) and field goal percentage (.602). He recorded double-doubles in each of the last two wins, and is shooting an amazing 87.5 percent (21 for 24) in Big West games. Junior guard Sheriff Drammeh is next in scoring at 11.8 points per game, and is also averaging 3.5 points and 2.3 assists per game. Senior forward/center Gibson Johnson is averaging 9.8 points and 5.6 rebounds per game, and junior guard Brocke Stepteau is contributing 9.8 points per game while shooting 46.8 percent from 3-point range. Freshman point guard Drew Buggs is averaging 7.3 points and 3.8 assists per game, and leads the team with 24 steals. Junior forward Jack Purchase has been slowed by a shoulder injury, but is still contributing 6.7 points, 4.9 rebounds and 2.5 assists per game. Doubleheader: The UH women’s team will play Long Beach State at 5:30 p.m. Fans with a ticket to the men’s game can arrive early to watch the women’s game. Promotions: Coca-Cola is the game sponsor and will distribute Star Wars cups at Gate A along with awarding great prizes throughout the night. Sign up for your chance to win at the sports marketing table at Gate A. Take your very own selfie at the Coca-Cola Star Wars selfie station located on the concourse level (Ewa Side) of the Stan Sheriff Center. H-Zone will be selling Star Wars t-shirts (while supplies last). UC Santa Barbara at Hawai’i, 8:00 p.m.
Looks like a real test. A real test that counts. I’m a little worried about this one. UCSB sounds legit with those two transfers. I think that is the way to find quick success for low majors like the Big West. UH “D” have to show up again and take away the 3 ball like they did vs. Cal Poly. Lets Go Bows! Ucsb definitely a top contender in the conference. Bigs need to stay out of foul trouble! Guards need to take care of the ball.